There's a great scene in the first season of Mad Men where Don unveils a campaign for Bethlehem Steel. "New York, Chicago, and Detroit—all brought to you by Bethlehem," reads the copy. The client rejects the pitch, but the sentiment itself was hard to argue with: steel from those small rustbelt towns was feeding the growth of a kind of city never imagined before the 20th century. Still, for most of us, it's hard to imagine that iconic landmarks like the Golden Gate Bridge or the Empire State Building ever didn't exist. In the same way we take these buildings and bridges for granted, we also rarely consider what cities were like before—or during—their construction. 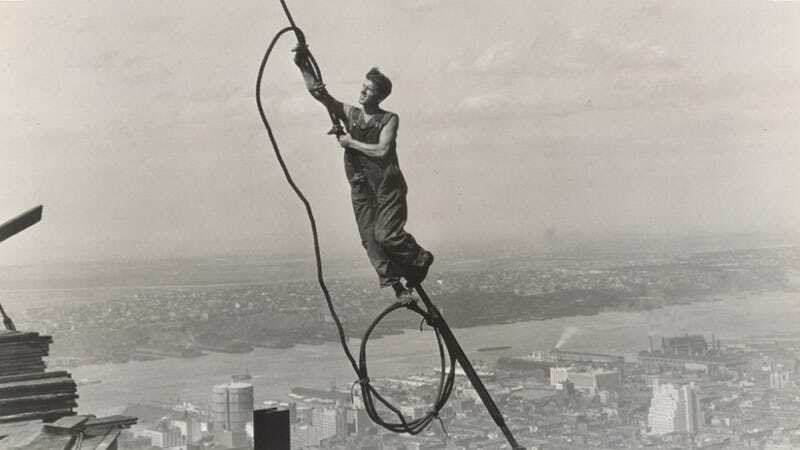 So, with that in mind, check out 20 of our favorite vintage construction photos below. And keep in mind, this is just a jumping off point—post yours in the comments, below. The Washington Monument in 1869, via. And a good one from the previous century: the construction of the Eiffel Tower, which began in 1887. The New York Times building under construction in 1903. The construction of the Manhattan Bridge, in 1909. The Lincoln Memorial in 1916, via. The construction of the Brooklyn Bridge. The LA City Hall under construction in 1927. Photo via. The Chrysler Building under construction, around 1929. The construction of the Empire State Building, in the early 1930s. A man stands on cables over the Golden Gate Bridge, circa 1933. 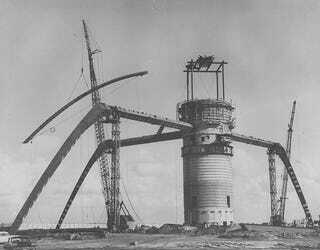 The construction of the LAX Theme Building, circa 1960. The World Trade Center, circa 1966. Ceasar's Palace construction, in Las Vegas, around 1965. Via. San Francisco's Transamerica Building, circa 1969. The Sears Tower under construction in 1970. Epcot under construction in the early 1980s.